When classifying fracturing fluids and their additives, it is important that production, operation, and completion engineers understand which chemical should be utilized in different well environments. A user's guide to the many chemicals and chemical additives used in hydraulic fracturing operations, Hydraulic Fracturing Chemicals and Fluids Technology provides an easy-to-use manual to create fluid formulations that will meet project-specific needs while protecting the environment and the life of the well. Fink creates a concise and comprehensive reference that enables the engineer to logically select and use the appropriate chemicals on any hydraulic fracturing job. 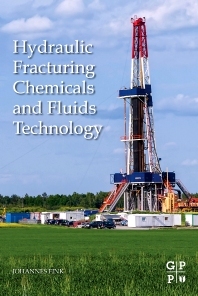 The first book devoted entirely to hydraulic fracturing chemicals, Fink eliminates the guesswork so the engineer can select the best chemicals needed on the job while providing the best protection for the well, workers and environment. Johannes Fink is a Professor of Polymer Chemistry at Montanuniversität Leoben in Vienna, Austria. Dr. Fink teaches macromolecular chemistry. His career spans for more than thirty years in the field of polymers, including characterization, flame retardancy and pyrolysis of polymers. Johannes has published multiple books and articles, including Petroleum Engineer’s Guide to Oil Field Chemicals and Fluids, 2nd Edition, Water-Based Chemicals and Technology for Drilling, Completion, and Workover Fluids and Hydraulic Fracturing Chemicals and Fluids Technology, all published by Elsevier.